Super Mario 3D World is the perfect culmination of all the Mario games that came before it. It shows influences from Super Mario Bros 2, Super Mario Bros. 3, Super Mario World, Super Mario 64, Super Mario Galaxy, New Super Mario Bros., and Super Mario 3D Land. The influences of nearly every game in the series can be felt in this celebration of the series. Like in Super Mario Bros. 2, Super Mario 3D World has 4 playable characters, initially. Mario, Luigi, Toad and Princess Peach all play roughly like they do in the NES classic. While the brothers themselves being playable it isn’t exactly a surprise, I believe this is the first time Peach has been playable since SMB2. It has a world made that is reminiscent of Super Mario World. It has the simultaneous multiplayer of the console New Super Mario Bros games. The touch of nearly all of the earlier games can be felt in this one. Super Mario 3D World lacks a little of the wonder of Super Mario Galaxy. Its little diorama levels do not feel as alive as Super Mario Galaxy’s planets. That appears to be deliberate choice. Galaxy was constantly trying, usually successfully, to overawe the player. It tried to make each level seem huge while keeping the player’s focus on the usually actually fairly narrow path. Super Mario 3D World lets the player see the seems. It isn’t trying to be anything more than it is; and what it is is immediately comprehensible. That is necessary when trying to play with more than one player. Everyone has to know where they are and where they are going. The game is almost a complete repudiation of the 3D level design of Super Mario 64. That game attempted to create mini-worlds, 3D World’s levels are clearly artificial levels. It works, but it is a trade off. There is still plenty of wonder in playing the game. That wonder comes from the delight in the almost puzzle like playgrounds that are its levels. It isn’t the exploration of earlier 3D Mario games, but more of just exploration of how. Something the Mario series does better than anyone else is in its variety. The player’s abilities are actually quite limited, but the game is constantly finding something new to do with them. There are a decent number of power ups. The flashy new one is the cat suit, which dresses each of the playable characters as a cat and gives them vaguely cat themed abilities. With the suit, Mario can climb up wall and swipe at enemies. The levels that feature that power up tend to have more verticality, taking advantage of the climbing abilities. Then there is the double cherries which create a duplicate of your character. That mostly serves to create mayhem, but it also allows for some devilish platforming challenges, requiring the players to keep multiples alive. There are also a bunch of classic power ups with more limited general uses and limited unique power ups that exist mostly for the levels they are found in. Added to that are the differences in characters. To get all the collectibles, some stages require using a certain character. Otherwise, it is smart to fit the character to a stage. For most stages, a player will likely want to use Mario or Peach, depending on the player’s skill. Mario, as usual, is the all around character while Peach is slow, but her hovering jumps act as a useful crutch for new players. Luigi is the best jumper of the group and is needed to get to some hard to reach area, while Toad is the fastest and can simply run by some obstacles. The game, infuriatingly but understandingly, tends to put character specific collectibles in stages where that character is not the expected choice. Still, all that is superfluous and only really interesting on a replay. For as good as the whole game is, and honestly Super Mario 3D World might be my favorite game in the series, the crown jewel are the Captain Toad levels. It makes sense that Captain Toad got his own spin-off based on those levels; they are a delight. While I called the regular stages dioramas, Captain Toad’s stages are the ones that really run with that idea. The stages are even more limited, mostly fitting onto one screen, and so is the character’s abilities. Toad can walk and he can walk slightly faster. That is about the extent of his skills. He can’t even jump. You have to mosey him around the stage snagging stars out from under the noses of oblivious enemies, mostly through stepping on switches and manipulating the stage. I love them. The biggest flaw with the game is that Nintendo shut down Miiverse. Miiverse has always been a great idea that was never going to work. There is a lot of 3D World Miiverse functionality that doesn’t do anything anymore. One of the collectibles from stages are generally very neat stamps for Miiverse posts that are now useless. Miiverse created a sense of community in the game and you feel its lack. Even without it, Super Mario 3D World is still a damn near perfect game. Super Mario 3D World was the best game to come out last year. There was some fierce competition, most of it from Nintendo themselves. A Link Between Worlds was great and The Wonderful 101 was something special. Still, 3D World was better. At this point, excellence is so routine to the Mario series it is expected. Somehow, Super Mario 3D World still surprises with it quality. While the game largely plays the same as the seminal 3DS’s Super Mario 3D Land, 3D World does feature ton of new stuff. There are new power-ups, most notably the catsuit and the double cherry. Both of those work well with the main focus of the game: the multiplayer. 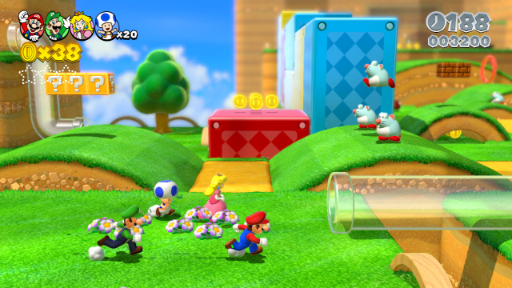 Like the New Super Mario series, 3D World is designed for up to four players. While making a 2D game, like NSMBU, accessible for multiple players is relatively easy. The game usually only has to track the players across one plane. Creating a 3D game with single screen multiplayer is much more difficult. 3D World accomplished this, primarily by fixing the camera high in the sky. The problem with that method is that it makes some jumps hard to judge. Not impossible, but it is occasionally unclear where exactly where Mario is. This problem is becomes bigger with a full four characters on the screen. The camera doesn’t track any one player’s movements, so sometimes you end up in the background, trying to complete difficult jumps blind. This would be a huge problem if it weren’t for the game’s most prominent power-up. The catsuit gives the player a ton of leeway on those jumps, since it lets the player climb on things. It is extra mobility in a game all about mobility. Even with that, multiplayer can get hectic. That is where the double cherry comes into play. No, it doesn’t alleviate the confusion of multiplayer, it multiplies it. In single player the cherry duplicates can be hard to track, it is nigh impossible with extra players. This is far from a bad thing. They craziness happening on the screen turns a delicate ballet of speed and momentum into an overcrowded party. Both of 3D World’s signature power ups play with the constraints of multiplayer. The biggest “new” feature of the game is also focuses on that. The Super Mario Bros 2 gang is present in 3D World, along with their unique gameplay styles. 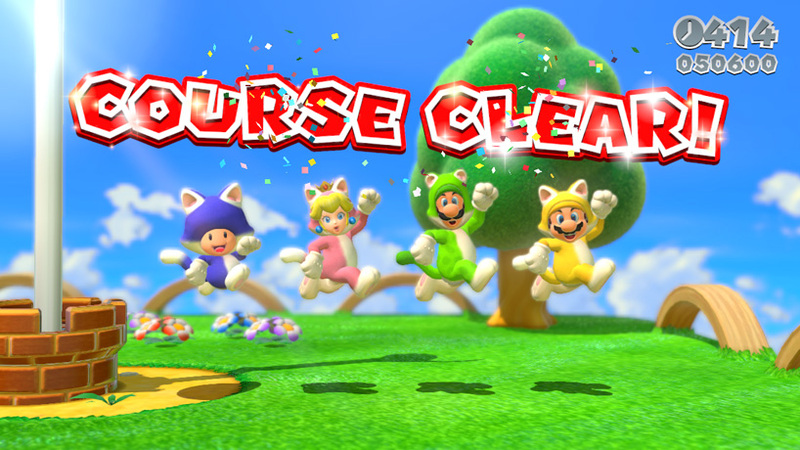 Mario is the all-around character, Luigi jumps the highest, Peach floats and I guess Toad runs the fastest. I mean, who uses Toad? All the focus on multiplayer did not cause the single player to suffer. All the things that help the multiplayer also work well in single player. The double cherry is fun every time it shows up, and the catsuit is fits naturally in with Mario’s usual power ups like the fire flower. The greatest boon are the multiple characters. Switching from character to character drastically changes how you approach levels. 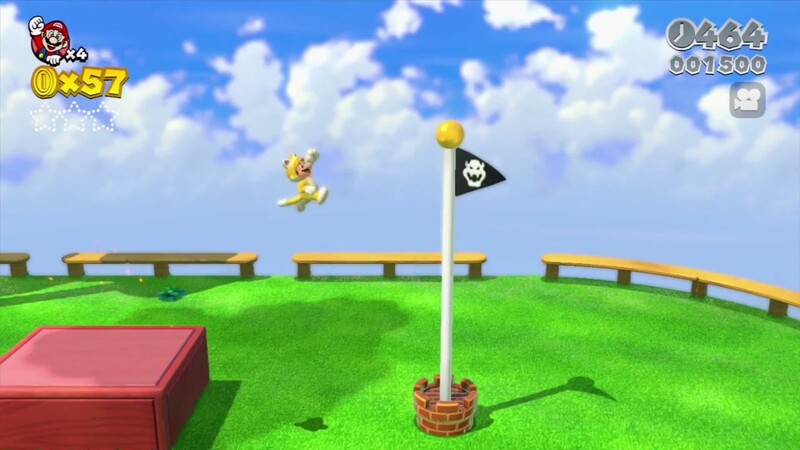 Peach acts as an easy mode, with her ability to float to out of reach collectables . 3D World is genuinely smartly designed, with elements that work with each of its different styles of play. All this and I didn’t really mention that the difficulty curve is pitch perfect and that the level design ranges from great to inspired. Or how the music is delightfully jazzy. Really, the game is just about perfect. Mario is still the king. Since Nintendo tends to limit their Mario releases to one per subseries per console, it will likely be a while before we see another Mario game. I am more than happy to savor this one for a while.